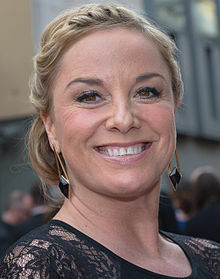 Tamzin Maria Outhwaite (/ˈaʊθweɪt/; born 5 November 1970) is a British actress from Ilford, Essex. Since coming to national notice playing Mel Owen in the BBC One soap opera EastEnders from 1998 until 2002 and then from 2018 onwards, she has starred in a number of theatre and television productions, including army series Red Cap and crime drama New Tricks. The only daughter of Anna (née Santi) and Colin Frank Outhwaite, born in Ilford, Essex, Tamzin has two younger brothers, Kes and Jake. She was educated at Trinity Catholic High School, Woodford Green. Outhwaite attended the Stagestruck Theatre Company as a teenager, taking part in several productions during the mid-1980s. While at school, she studied part-time at Sylvia Young Theatre School and on leaving school in 1987, she joined the London Studio Centre to study drama and dance. On graduation from the London Studio Centre she started her career in the theatre, taking roles in productions including Grease and Oliver!, and work at the Stephen Joseph Theatre, before landing bit parts in television series The Bill and Men Behaving Badly. She found national fame in 1998 when she was cast as Mel Healy in the popular BBC soap opera EastEnders. Her first appearance was aired in October 1998 and her final one was in April 2002. During nearly four years in Walford, Outhwaite's feisty character was central to many explosive storylines. Outhwaite left EastEnders in 2002, shortly after the departure from the soap of co-star Martin Kemp, who had played her on-screen husband Steve Owen. She stated in 2006 that she wouldn't rule out returning to EastEnders and her return was confirmed on 24 October 2017. She appeared in a revival of Boeing Boeing at the Comedy Theatre, the film Cassandra's Dream, and the ITV drama series, The Fixer, which was shown in March and April 2008. In 2009, she played the lead in the sci-fi crime series for the BBC entitled Paradox, which first aired on BBC1 on 24 November 2009. In 2010, she appeared in Over the Rainbow, a talent show casting for Andrew Lloyd Webber's stage production of The Wizard of Oz. In the same year, she was a member of the judging panel on the UK television programme Don't Stop Believing broadcast on Five. She joined the cast of the popular BBC TV comedy-drama series New Tricks as DCI Sasha Miller, replacing Amanda Redman as head of the team in the show. Outhwaite had earlier appeared in series 9, episode 6 of the show, guest-starring as a different character who is brought to justice at the end of the episode. Outhwaite has been cast to play Teresa Phillips in a revival of Alan Ayckbourn's How the Other Half Loves at the Theatre Royal, Haymarket in March 2016. Outhwaite has done introductory segments of true crime episodes of NBC's Dateline for British television audiences. Outhwaite lives in London. From 2006 to 2014, she was married to actor Tom Ellis. They have two daughters together. It was announced in 2013 that the couple had separated and the following month Outhwaite had filed for divorce. Outhwaite has been in a relationship with actor, Tom Child since 2017. 1996 The Bill Liz Crane "Hers"
2000 Da Ali G Show Melanie "Gail Porter"
2004 Hustle Katherine Winterborn "A Touch of Class"
2011 Law & Order: UK Miriam Pescatore "Immune"
2012 Silent Witness Beth Gilston "Fear: Parts 1 & 2"
2012 New Tricks Victoria Kemp "Love Means Nothing in Tennis"
2013 Foyle's War Brenda Stevens "Sunflower"
2013 Doctor Who Captain "Nightmare in Silver"
2013 Agatha Christie's Marple Mrs. Rogers "Endless Night"
2016 Josh Valerie "Bed & Breakfast"
2016 Midsomer Murders "The Curse of the Ninth"
2017 Inside No. 9 Connie "Empty Orchestra"
2017 Murdoch Mysteries Penelope Marsh "Up from Ashes"
2018 Midsomer Murders "The Lions of Causton"
^ "BBC One: New Tricks". BBC. Retrieved 3 July 2017. ^ "Outhwaite won't rule out 'Enders return". 22 April 2006. ^ "Tamzin Outhwaite returns to EastEnders". BBC News. 24 October 2017. Retrieved 26 October 2017. ^ "Allen role for Tamzin Outhwaite". BBC News. 22 August 2006. Retrieved 8 April 2008. ^ "Bees to buzz off". The Mirror. 5 October 2007. Retrieved 8 April 2008. ^ "Outhwaite to star in sci-fi drama". BBC News. 22 May 2009. Retrieved 24 May 2010. ^ "Casting announced for How the Other Half Loves". Retrieved 20 March 2016. ^ "Dateline with Tamzin Outhwaite TV Guide from RadioTimes". Radio Times. ^ "'We had a beautiful baby girl': Tamzin Outhwaite and husband Tom Ellis welcome second daughter Marnie Mae". ^ Kelby McNally. "Tamzin Outhwaite 'files for divorce from Tom Ellis, citing adultery'", Express, 10 September 2013. ^ (No author.) "Tamzin Outhwaite 'Divorcing' Tom Ellis After He Reportedly Admits Cheating With One-Night Stand", Huffington Post UK, 9 October 2013. ^ Kelby McNally. "'We're all moving forward' Tom Ellis speaks out about Tamzin Outhwaite split", Express, 19 September 2013. ^ Watts, Halina (15 August 2014). "Tamzin Outhwaite left distraught after discovering great granddad was sent to WW2 prison camp". ^ "Tamzin Outhwaite". RTÉ. Archived from the original on 17 October 2007. Retrieved 8 April 2008. ^ "Tamzin Outhwaite - Who Do You Think You Are - Former Eastenders actress with true East End roots discovers more about her Italian ancestry". www.thegenealogist.co.uk.